ISSAC is the yearly premier international symposium in Symbolic and Algebraic Computation that provides an opportunity to learn of new developments and to present original research results in all areas of symbolic mathematical computation. 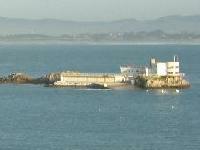 In 2004, ISSAC is hosted by the University of Cantabria, in the city of Santander, Spain, July 4-7. The first Richard D. Jenks Memorial Prize for Excellence in Computer Algebra Software Engineering was awarded to the Singular Team (Kaiserslautern, Germany). The best paper of the conference is authored by Xavier Dahan and Eric Schost, and the best student author award went to John May and Zhengfeng Yang. The votes of the conference participants selected two distinguished posters, authored by Z. Chen and A. Storjohann and by O. Ruatta, M. Sciabica and A. Szanto. The distinguished software presentation prize went to M. Brazier and A. D. Chtcherba. The ISSAC 2005 home page is available. These web pages are displayed in their intended way with the following browsers: Netscape 7, Mozilla 1.0, Internet Explorer 6 or their more recent versions. The design assumes minimum 1024x768 screen resolution, which is quite common nowadays. Please note that the key used for SSL-secured pages is not certified by any company for the simple reason of cost reduction.